If you sit still for a minute at around noon in Livissi and put a hand on the wall of one of the stone houses, you can almost hear the sounds of life that once filled this village, which suddenly emptied in 1922. Until then, Livissi was populated mainly by Greeks – 3,500 according to some sources and 6,500 according to others – who were forced to abandon hearth and home as part of the population exchanges between Greece and Turkey. Today Livissi is a ruin of its old self, hidden behind a hill in a dense forest just a few kilometers from the Turkish coastal resort of Fethiye (Makri in Greek), a two-hour boat ride from the Greek island of Rhodes. A handful of Turks remain, mostly at the southern end of the settlement. 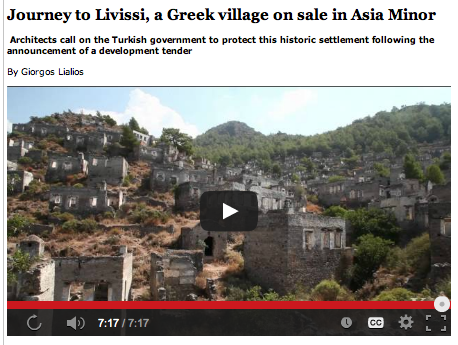 After decades in obscurity, Livissi was brought back into the spotlight recently when the Turkish Ministry of Culture and Tourism announced a tender for the development of about one-third of the historical part of the village into a tourist resort. According to media publications, the investor will be granted a 49-year lease and will also be responsible for renovating the rest of the settlement. Kathimerini traveled to Livissi to record the stories and the voices of those who reacted to the news, both in Greece and Turkey. I would like to thank Peter Martinovich for posting this link on the Hellenic Genealogy Geek Facebook group.